What Is French Service Catering (Service à la Française) for Weddings? What Is French Service Catering for Weddings? French service, or service à la Française, is a style of service in which food is prepared and/or served by waiters table-side. The cuisine itself does not have to be French to be considered a part of French service. Today, French service is commonly used to present appetizers and meals including guacamole, Caesar salad, flambé, and meat carving. French service is generally appropriate for smaller weddings or those with a budget large enough to hire numerous servers. 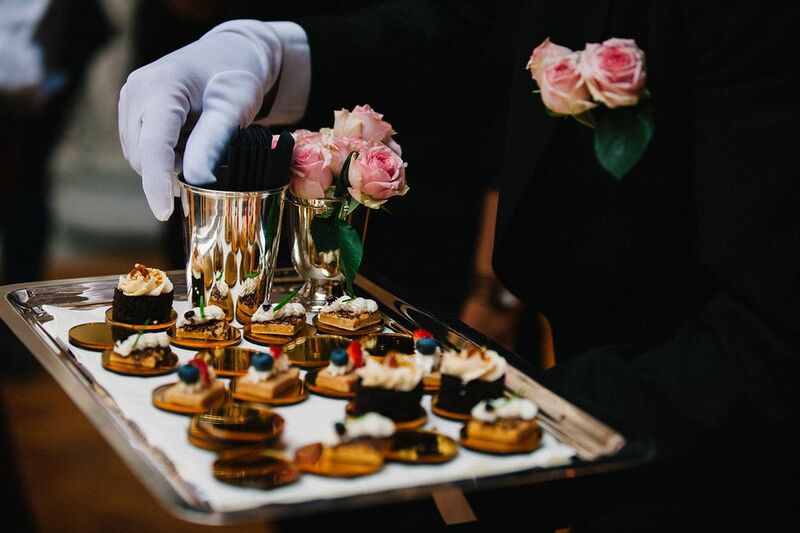 If you have a small number of guests and can afford it, French service provides guests with an unparalleled level of hospitality that is bound to impress guests. The two types of French service include French cart service and French banquet service. French cart service is a method in which food is partially prepared in the kitchen and brought out on a cart to be fully prepared table-side. It is an uncommon, technically-demanding, and highly professional serving method reserved for upscale restaurants, high-end resorts, and cruise ships. The cart typically includes a burner and a large cutting board. Two servers, typically a chef/main server (chef de rang) and an assistant (commis de rang), work together to serve guests. The chef de rang prepares and plates dishes, which might include deboning, slicing, and garnishing, while the commis de rang serves guests and clears the table. Before this service, the table is set with silverware and glassware. This serving method can be used for serving appetizers, desserts, and even a complete eight-course meal. French banquet service is a technique in which platters of food are assembled in the kitchen, brought by table-side, and served to guests à la carte. With this type of method, two servers work together to serve guests. The lead server is responsible for individually serving guests, and the assistant sets plates and clears dishes. Everything is individually served, such as bread, salad, soup, entrees, and more. Although the servers do not prepare food table-side, this technique still requires an enormous amount of skill. One positive aspect of French service is that the elaborate serving method adds an air of elegance and offers an artistic, entertaining way of showcasing food. Guests also receive the utmost level of service and personalized attention. With this service, you truly get what you pay for. On the other hand, there are some negatives. For example, French service is undoubtedly a slow and time-consuming serving process. It also requires additional servers and also might require a larger dining venue. The room has to be large enough so servers can move about freely and prepare food effectively. Butlered Service: With this formality, food is prepared and plated in the kitchen, presented on a tray, and served to guests. Utensils are already provided on the table. English Service: Here, the server serves guests individually from a large dish. It's similar to a formal version of family-style dining. Russian (Silver) Service: Using this service, food is cooked table-side, like French cart service. However, the server assembles a platter of food, and the guests help themselves.